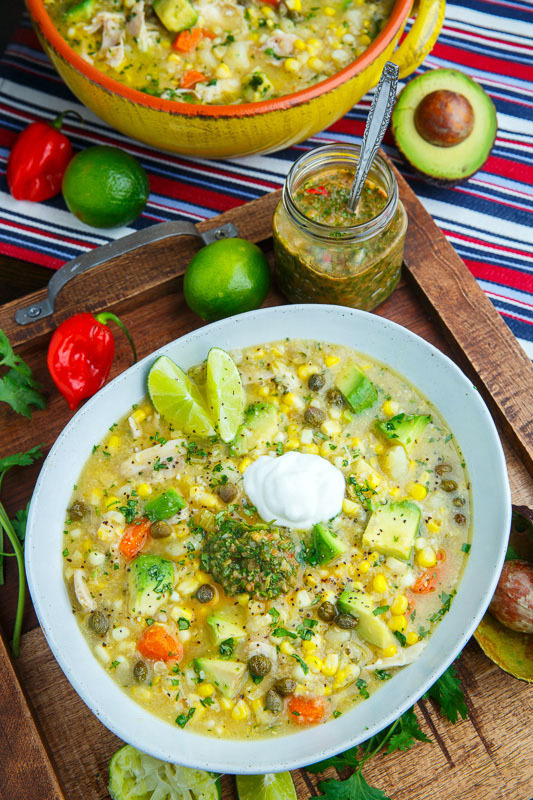 A tasty take on Ajiaco, a Colombian style chicken and corn soup with a thick and creamy broth and tons of flavour! 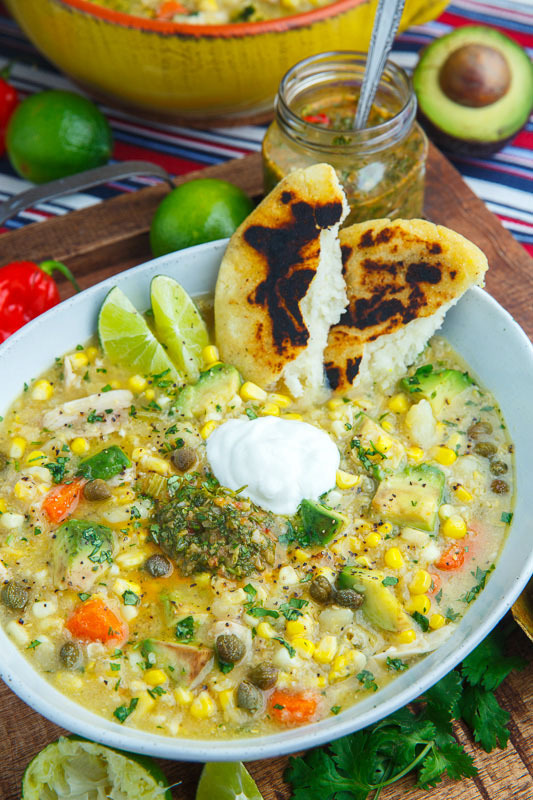 Today I have a tasty chicken and corn soup recipe for you; Ajiaco, a Colombian style soup with a nice, thick and creamy broth! 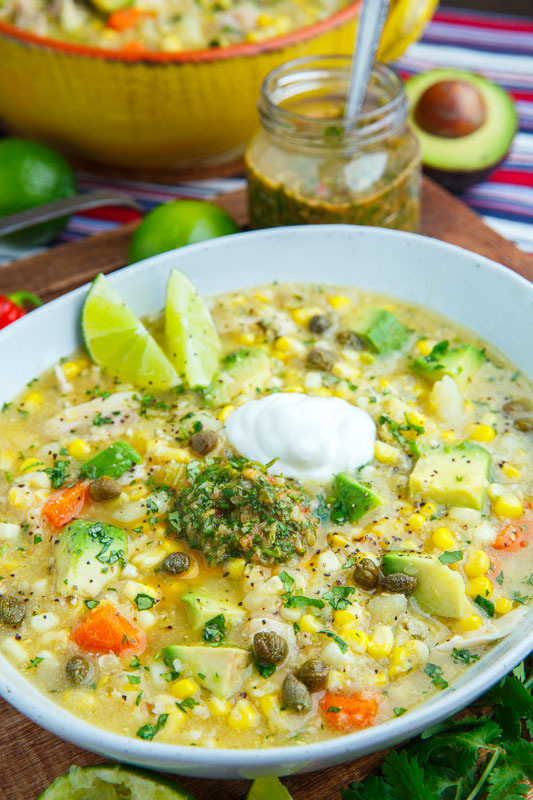 This soup is amazingly fresh with the corn, cilantro, avocado and lime juice and it’s also nice and hearty with the chicken and potatoes! Typically papa criolla, a type of potato, are used to get the thick and creamy broth but since I do not have access to them I puree some of the corn and potatoes into the broth, which after simmering for a while both melt into the broth creating a very nice creamy texture! 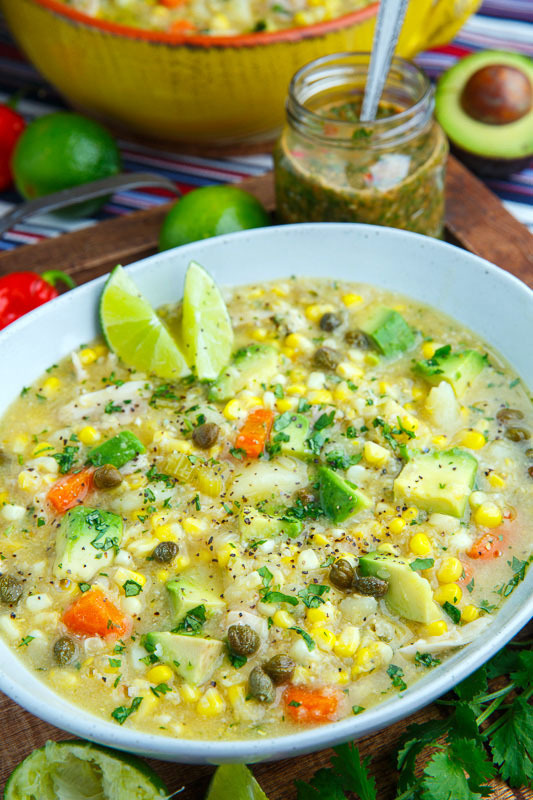 There is an amazing balance of tart, sweet, salty and spicy created in this soup with the lime juice, corn and capers with the spicy coming from the aji picante (a Columbian style hot sauce)! I like to kick up the saltiness and add a bit of umami with the addition of white miso paste. 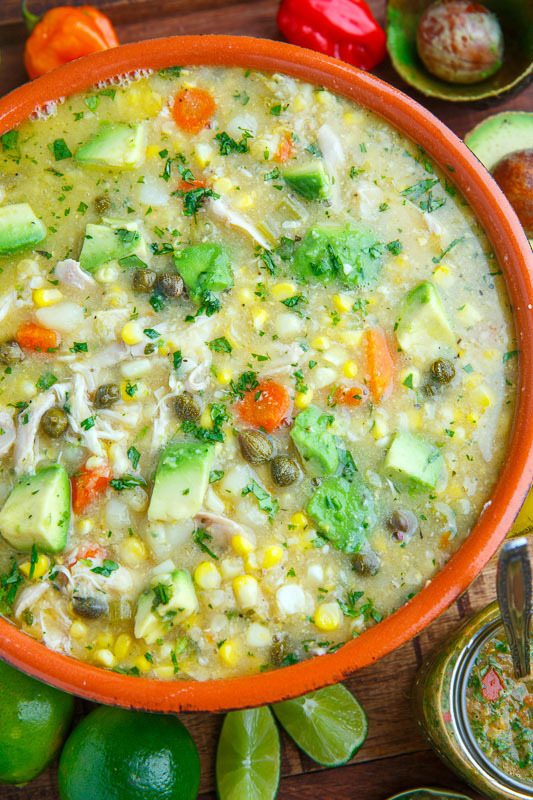 This Colombian chicken and corn soup (ajiaco) is pure comfort food that is perfect both for cold winter days and for hot summer days! Heat the oil in a large heavy bottom sauce pan over medium-high heat, add the onion and cook until tender, about 3-5 minutes, before adding the garlic and cooking until fragrant, about a minute. Puree 1/3 of the potatoes and 1/3 of the corn into 1 cup of the chicken broth in a food processor. Add the broth, pureed veggies, the remaining potatoes, corn, carrots, oregano, thyme and bay leaves, bring to a boil, reduce the heat and simmer until the potatoes and carrots are tender, about 20 minutes. Remove the bay leaves, add the lime juice, cilantro, miso, salt and pepper and enjoy garnished with aji picante, avocado, capers and sour cream! Slow Cooker: Optionally implement step 1, place everything from steps 1-3 into a slow cooker and cook on low for 6-10 hours or high for 3-5 hours before continuing with step 4. Option: * For the chicken feel free to use already cooked and shredded chicken or place chicken breasts, thighs or legs into the soup, cook with the soup, remove, shred and return to the soup. I like to poach a full chicken in the broth along with the cobs of corn after removing the kernels from them to infuse the broth with even more chicken and corn flavour! Note: Miso paste is not traditional but I like the added umami/flavour! Feel free to omit it or to replace it with a few splashes of fish sauce! Yum! Note: This is traditionally made with fresh guascas and papa criolla (andean potato) rather than with oregano, thyme and potatoes. Option: Serve with fresh arepa! This looks so incredibly flavorful! I love that you added capers! I want a large bowl of this soup right now! Wow! Loving all the flavors! do you cook the veggies before putting in the food processor? Kathy: The corn and potatoes are pureed uncooked. Enjoy! Delicious and coming from a colombian well my parents are. Thank you!!! This looks so good but for me will have to delete the hot stuff, I’m alleregic to chilli, curry etc…. I also cilantro is that the same as Corriander if so, could I use Dill or flat leaf Parsley? 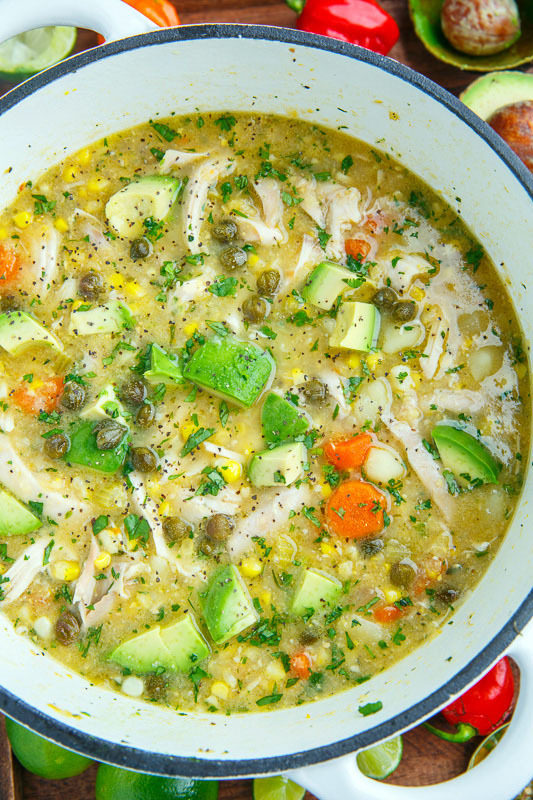 I love the addition of Capers an extremely under used ingredient. I am from Australia and I’m think the Brit’s call corriander, cilantro too… Thankyou in advance…. Cilantro and coriander are the same and you can replace them with parsley! I have not tried dill but I think that would be good as well! Enjoy!